Of course, Mandel wasn’t actually witnessing a revolution, and today his story might be turned into a clever car insurance ad. But in his strange joy, we can see the spirit of May ’68. The revolt, which spread from the suburban campus of Nanterre University to every corner of France, produced a new left that would have a mighty influence. In the end, May wouldn’t just belong to the students. By the end of May, the situation was spiraling out of the government’s control. On May 29, French president Charles de Gaulle, shaken by his failure to contain the movement and hoping to shore up his position with the military, fled the country to meet secretly with his army leaders across the border in West Germany. Eventually, de Gaulle was able to restore order, and the movement came to an abrupt end. Its defeat was compounded by the results of elections called by the government in late June, in which the Gaullists managed to take advantage of confusion and infighting on the Left to score a decisive victory. Yet, even now, May ’68 remains a potent political symbol of the Left’s hopes for a mass movement to challenge capitalism. Nowhere else in the Western world over the past half century was such a threat to capitalism posed. The origins of the May movement lay in the postwar reconstruction of the shattered French economy and state administration. In the years preceding 1968, France had experienced rapid economic growth, embodying the favorable climate of Les Trente Glorieuses (or “thirty glorious years,” as the era is known in France). Yet at the dawn of 1968, French society remained a profoundly undemocratic and unequal society. During the 1950s and early ’60s, factory workers had seen their average weekly work-hours increase substantially as employers rushed to fill the labor shortages produced by rapid economic growth. By the mid-sixties, many routinely worked upwards of fifty hours a week. Similarly, for women inside and outside the workplace, de Gaulle’s France was a highly repressive society: the rigid enforcement of traditional norms around gender and sexuality meant that it was not until 1965 that women were granted the right to work without their husband’s permission. Even then, they could not legally get an abortion under any circumstances, and their access to birth control was strictly limited. Politically, France was a highly centralized state committed to a type of conservative modernization that strictly limited democratic rights. Economically, a state-directed and heavily regulated capitalism had produced impressive economic growth and industrialization. This system was, above all, the creation of General de Gaulle, hero of the Liberation, who led the opposition to the Nazi-backed Vichy regime. During the 1950s, de Gaulle had been out of the national spotlight, while France was ruled by the parliamentary regime of the Fourth Republic, in which one unstable coalition government after another governed while the country floundered through two bloody colonial wars, first in Vietnam, then in Algeria. By decade’s end, the political crisis resulting from France’s failed effort to hold onto Algeria, the last citadel of its crumbling empire, compelled him to return to politics. With backing from the army and much of the Right, de Gaulle returned to the Élysée Palace in 1959. De Gaulle entered office a hero of France’s vocal pro-colonial lobby. His return came after an attempted coup in Algiers, initiated by segments of the military and led by General Jacques Massu, whose use of torture in Algeria was legendary. For the right-wing officers who participated in it, the putsch was meant to block proposed negotiations with the National Liberation Front (FLN). Once in power, however, de Gaulle quickly enraged his supporters on the Right by moving rapidly to negotiate an agreement for Algerian independence. By signing the 1962 Évian Accords, de Gaulle earned himself the unvarnished hatred of the pieds-noirs — hundreds of thousands who chose to depart for the mainland rather than remain in an independent Algeria. In 1961, right-wing opponents of Algerian independence had formed a terrorist group, the OAS, with the aim of overthrowing de Gaulle, who on several occasions narrowly escaped their assassination attempts. But if the Gaullist state was at war with the far right, its true enemy was the Left. The President had always been strongly anticommunist, and his nationalism had no room for an independent left or labor movement to challenge the state’s authority. When he returned to power soon after the coup in Algeria, many on the Left had denounced him as the representative of far-right elements in the French military. In the early 1960s, the CRS (national paramilitary police) were led by holdovers from the Vichy era. Unsurprisingly, given this background, they engaged in repeated acts of violence against leftists, immigrants, and other enemies, notably, a massacre of Algerian demonstrators in 1961 that left hundreds dead. That incident, and another deadly police attack on protesters the following year, meant that the government and police were often reviled by the Left as crypto-fascists. De Gaulle, however, was not just another right-wing authoritarian. Despite his anticommunism, he tried to buck American hegemony by carving out an independent foreign policy. In the field of economic policy, de Gaulle was no proponent of free-market policies, but advocated for the muscular statism that came to define postwar French capitalism. This approach reflected de Gaulle’s commitment to a French national revival, as well as his desire to counter the influence of the Left. This system provoked strong opposition from organized labor and the Left. During the postwar decades, that opposition was led by the Communists and their trade union allies. Lionized for its role in the resistance, the Communist Party emerged out of the Second World War as the most popular party in France, winning more than a quarter of all votes in National Assembly elections. Throughout the late 1940s and early ’50s, the PCF continued to claim 200,000 members. The PCF also controlled the main trade union federation, the CGT, which at war’s end had nearly 4 million members. But if the Gaullist state was at war with the far right, its true enemy was the Left. In 1956, however, the Communist movement was thrown into crisis by the combined impact of Khrushchev’s “secret speech,” which detailed the repression of the Stalin years, and the Soviet invasion of Hungary. In France, well-known public figures denounced the invasion and distanced themselves from the PCF. The party found it was unable to convince some of its militants to pass out leaflets supporting the Soviet government, and it lost thousands of members. Nonetheless, the PCF would recover from that setback, and by the 1960s, it had emerged as the leading representative of Communist “orthodoxy” in Western Europe, opposing the “revisionism” of the Italian Communist Party (and those internal dissidents who were dismissed as “Les Italiens”). At the same time, the PCF was being sharply criticized by forces to its left for its tepid opposition to French colonialism in Algeria. French Communism had few remaining allies. Cold War divisions and official anticommunism ensured that even if the PCF enjoyed deep reservoirs of support and a large membership base, it could not break out of its isolation or garner an electoral majority. Yet the party’s hegemony on the Left would shape the events of May ’68. At the same time, Communist influence within the labor movement politicized workers in ways that helped push them toward confrontation with the boss. Drawing on the legacy of the June 1936 strike movement, PCF and CGT members helped to spread the sit-down strike tactic. In many cases, their efforts eventually put them at odds with Communist officials. Yet despite these disagreements, workers joined both the party and the union in large numbers during the May–June strikes. Throughout the crisis, the PCF and leading currents within the non-Communist left pushed for de Gaulle to be replaced by a left government, led by one of two forces — Pierre Mendès-France, a former Radical Party leader and prime minister, now associated with a small socialist group called the Unified Socialist Party (PSU); or, François Mitterrand, former presidential candidate against de Gaulle in ’65, representing the Federation of the Democratic and Socialist Left (FGDS). Yet differences between them remained, and those differences would have significant consequences for the Left’s deteriorating fortunes as the movement progressed. These dynamics paralleled developments inside the labor movement, where divisions between the Communist and socialist left, hardened by the Cold War, had also shaped the organization of French trade unions. Traditionally, unions were split between competing confederal bodies. The largest was the Communist-led CGT, followed by the increasingly radical, but non-Communist CFDT; and the more apolitical Force Ouvrière (FO), a Cold War split from the Communist union. For labor, de Gaulle’s France was not a friendly place. Through a system of industry-wide bargaining, French unions were able to negotiate over matters like minimum wages. But they had little workplace power, and were always subordinate to state control. Low union density went hand-in-hand with labor’s lack of influence within the state. This system contributed to the constant conflicts between workers and management that made French industrial relations so volatile. For instance, during the 1960s, French capitalism was plagued by high strike rates. In the absence of institutional channels for reaching compromise agreements with employers, workers tended to settle disputes with the boss through unauthorized strikes, walkouts, or other disruptive job actions. Grievances were often resolved through temporary work stoppages, which were rarely called by the unions and were often only approved by union officials after the fact. This had important consequences. Unable to contain shop-floor militancy and labor’s wage demands through consensus bargaining, officials instead opted to provoke a slowdown in economic activity to limit the growth of pay, and thus of inflation. The result was a “stop-go” pattern that saw the French economy swing between periods of rapid expansion and bouts of government-engineered recession. In September 1963, for instance, Finance Minister Giscard d’Estaing announced a “stabilization plan,” designed to counteract inflationary pressures by reducing financing for industry, raising taxes, cutting government spending, and freezing prices for selected consumer items — an approach that did, in fact, lead to an economic slowdown. This economic model produced rapid growth after World War II. But it also generated serious instability, which would later help drive the revolt of May ’68. By the second half of the 1960s, France had experienced repeated bouts of stagnation, including one that hit just before May 1968. 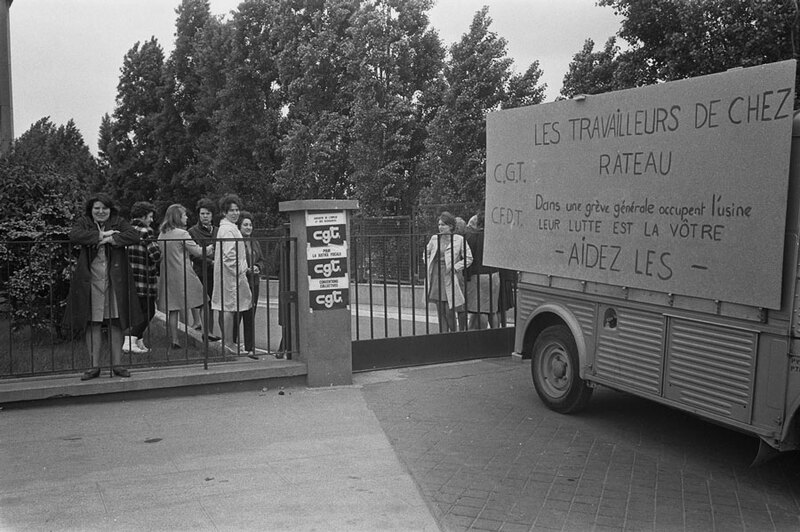 Between the spring of 1967 and the end of that year, the number of jobless workers increased by more than a quarter, and nearly 500,000 were unemployed at the start of 1968 — an unprecedented figure for the postwar era, when France enjoyed close to full employment. These tensions finally boiled over at the end of April. On May 2, after further protests, the university administration announced that Nanterre would be closed indefinitely. In response left-wing students organized a mass meeting at the Sorbonne, in Paris’s Latin Quarter, which would become a central hub for the student revolt — its Grand Amphitheater the scene of mass meetings, and the streets and alleyways that surround it, a focal point for the conflict between students and authorities. The next night, fears of a possible crackdown on the students meeting inside the Sorbonne led an angry crowd to gather. That evening, police attempted to enter the building, beating and arresting students as they tried to exit, while the crowd began to throw rocks and bottles at them. What followed was a night of violent clashes that left more than 100 injured and 596 arrested. 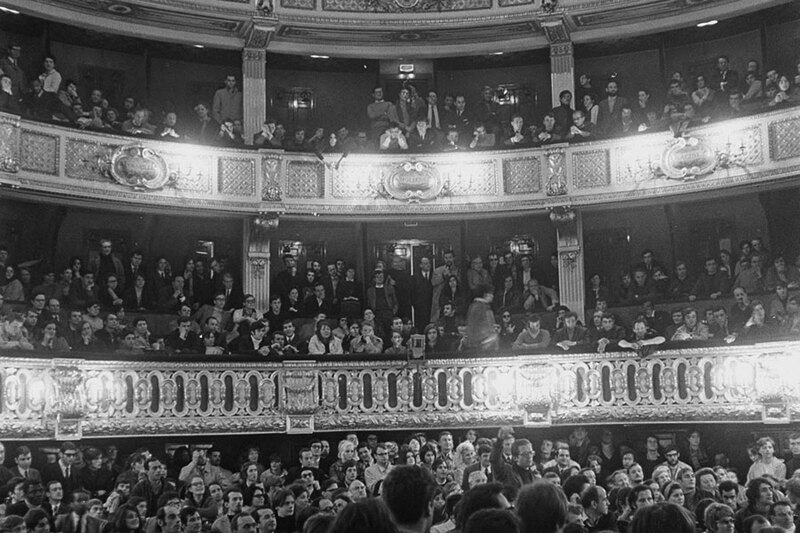 The next day, the Sorbonne too was closed, leading student groups to call for an indefinite strike. As the confrontation between students and the government escalated, officials decided to ban demonstrations in central Paris. In response, on May 6, tens of thousands of protesters, led by the national union of students, UNEF, and the radical faculty union, gathered in the Latin Quarter. Finding themselves under attack from the police, who sought to disperse the protests with tear gas and billy clubs, they began to build makeshift barricades, leading to running street battles which saw 422 arrests and almost a thousand injuries. The protests soon spread to other universities and high schools, as students demanded that the government agree to withdraw police from the universities, reopen the shuttered campuses at Nanterre and the Sorbonne, and drop criminal charges against those jailed. In the face of this growing movement, the government remained intransigent. 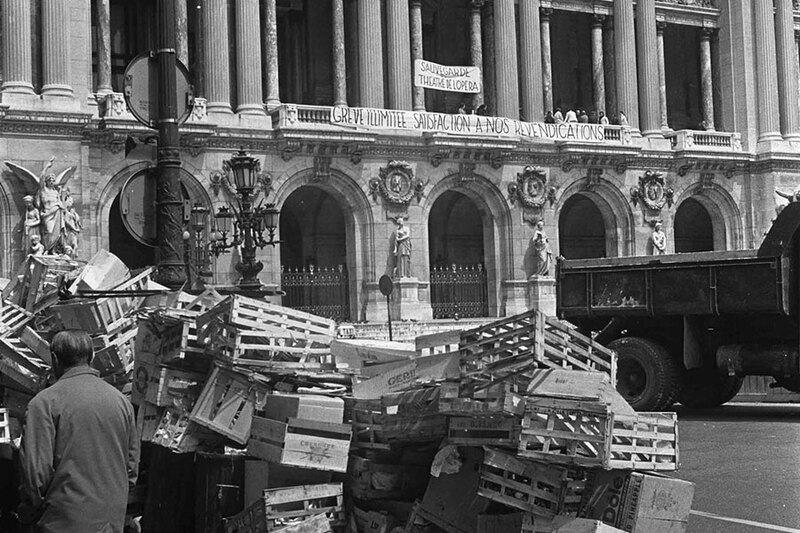 After several days of fruitless negotiations, on May 9, the Education Ministry reaffirmed its decision to close the universities, setting the stage for the events of May 10–11, when students occupying streets around the Sorbonne attempted to hold off thousands of riot police during the “Night of the Barricades.” Protesters erected dozens of barricades, using cobblestones pried from the Latin Quarter’s medieval streets and anything else that was handy to construct ad-hoc fortifications. Facing a massed police presence on the Boulevard Saint-Michel, they armed themselves with helmets, sticks, and makeshift projectiles. When the assault began at 2 am, students attempted to fight back, chanting “de Gaulle, murderer” before being quickly routed. The government repression that followed was so intense that even sympathetic observers were moved to criticize the police’s tactics. By night’s end, the Latin Quarter was the scene of destruction, with hundreds of cars burned, almost 900 wounded, and 469 arrested. Yet the government was forced to concede to the students’ key demands: Prime Minister Pompidou agreed to reverse the university closures and free those jailed while protesting. This combination of repression and concessions failed to stem the growth of the movement, however, and when the Sorbonne reopened on May 13, activists quickly occupied it, setting up a committee to direct activities in the newly liberated “people’s university.” In the days that followed, roughly 400 popular action committees were set up on different campuses and neighborhoods across Paris, while universities throughout the country were seized by protesters. The days that followed saw the growth of the strike movement into an indefinite work stoppage. That development began at the Sud-Aviation plant in Bouguenais, near Nantes, where on Tuesday, May 14, more than 2,500 employees at the factory, who had fought for months against a decision to cut working hours, launched May’s first major sit-down strike. The next day saw another factory occupation at the Renault plant in Cléon. On Thursday, the work stoppages began to spread rapidly, as workers launched occupations in key manufacturing hubs, among them Renault’s Boulogne-Billancourt production facility, just outside Paris, a historical center of French automobile manufacturing. The strike wave shut down nearly all of France’s industrial conglomerates, much of the public hospital and educational systems, air transport, the Paris regional train network, the national rail system, and a number of public utilities. In the state-owned radio and television companies, employees went out, as did workers in the print media, where stoppages temporarily prevented newspapers from being distributed. The strike movement was surprising not only for its scope, but for its militancy, reflected in the factory occupations that saw workers across France seize control over their workplaces. These strikes were not motivated by any unified set of demands, but workers were often driven into action by shared grievances over stagnant wages, long hours, continuous speedups, and the constant threat of repression at the hands of management. The strikers were not all men; in some industries, like textiles, women made up a large proportion of participants. Nor was the workplace revolt limited to younger or more marginal workers. In fact, in key industries like auto manufacturing and aerospace, work stoppages were more common in bigger factories, like the large plants that dotted Paris’s western and northern suburbs, where unions were stronger and workers tended to have stronger traditions of internal organization. Most often, the strikes were led by more experienced workers who were over thirty years old. For the most part, these were longtime militants with strong roots on the shop floor and a history of union activism. The PCF, which remained deeply suspicious of the student radicals, was much more measured in its rhetoric and proposals. The Communists advocated negotiations between the unions and the state for resolving the conflict, while also calling for de Gaulle’s resignation. His departure, it was hoped, would permit the formation of a united government of the center-left parties, along the lines of Léon Blum’s 1936 Popular Front coalition. To all those who wish to confine the people’s movement or to limit its aims in order to control it better, to those who think they can answer the overall challenge to capitalist society by simply changing the parliamentary balance or a governmental formula, to those who are still hesitating because they did not believe in the student revolt and had doubts about the student-worker alliance during the struggle, we must … respond by opening up new prospects for them. These kinds of tactical blunders by the government only deepened the crisis. On May 24, de Gaulle took to the airwaves for an emergency television address to the nation. Declaring France to be “on the brink of paralysis,” de Gaulle raised the specter of “civil war” if the situation did not improve. To that end, he announced a national referendum for June, which would allow the public to give its verdict on his handling of the crisis. He asked voters to show their confidence in him through a “massive” yes vote, promising to resign if the results of the referendum went against him. In an effort to bring the strikes to an end, the government now called a conference which brought together the unions and employers. The resulting Grenelle Accords, agreed to on May 27, gave labor a variety of new workplace rights, including the right to organize on the shop floor, to pass out literature, and to collect dues from members inside company gates. The Accords also provided for significant pay increases, including a 35 percent boost in the minimum wage and a 10 percent bump for better-paid workers. Furthermore, employee working-time was to be cut by one to two hours a week. For the unions and state officials alike, the hope was that the Grenelle Accords would allow for a rapid end to the strike movement. However, before the agreement could be implemented, it had to be ratified by a workforce whose intransigence had only increased through the factory occupations. The problem was that, for the most part, the striking workers were disappointed by the relatively limited concessions provided in the Accords. Many found particularly objectionable a clause which allowed management to recoup work hours lost due to the strike through additional overtime. French unions, weakened by more than a decade of government hostility and unfavorable labor policies under de Gaulle, now lacked the influence to overcome this resistance. Opposition to the deal was especially strong in the large factories that dominated French manufacturing, where workers in some of France’s key industrial conglomerates, including Renault, Citroen, and Sud-Aviation, refused to ratify the Accords. Union officials were forced to pivot to endorse the more confrontational stance. On May 27 a mass meeting of Renault workers, addressed by leaders of the major federations, overwhelmingly rejected the agreement. Mendès-France said that he was ready to serve as prime minister in a coalition government, so long as it included the “whole left,” including the Communists. The PCF had never liked the idea of having the ex-Premier as a coalition partner, and it now tried to sideline him in favor of an alliance with Mitterrand and the more moderate socialist leader, former Prime Minister Guy Mollet. Yet Mendès-France was, by this point, viewed by most of the Left outside of the Communist Party (and even by some Gaullists) as the only figure who could take the reins of government. On May 29, in a show of strength, the CGT organized a march that brought out 500,000 protesters yelling “Adieu, de Gaulle” and calling for a “popular government.” For de Gaulle, fears that the demo would become an opportunity for the Communists to launch an insurrection (something they had no intention of doing) added to the growing sense of despondency. The president, fearing that his loss of authority was irreversible, now sought to shore up his support with the army, sending emissaries to the key generals to sound them out on the crisis. Later in the day on May 29, with the president scheduled to address the nation just a few hours later, de Gaulle decided to leave the capital. His mysterious disappearance led to rampant speculation about his whereabouts. The government later claimed that he had departed for a planned visit to his country home, a claim that was too absurd to be believed. In fact, de Gaulle had gone to Germany, where the French army had its headquarters in the town of Baden-Baden. There he met with his old enemy, General Massu, who now headed all French forces in Germany. No one knows just what de Gaulle’s intentions were in leaving the country, but Massu would later say that the president was so depressed upon his arrival that only his own pleading convinced him to return to Paris. After six hours, de Gaulle arrived back in France, waving away his temporary disappearance as a “momentary lapse.” That afternoon, he gave a television address in which he announced that he would not step down or replace Pompidou. Claiming that the demonstrations were driven by “totalitarian” Communists, who he accused of attempting to seize power through a mixture of “intimidation, intoxication, and tyranny,” de Gaulle told the public that he had decided to postpone plans for a referendum and would instead dissolve parliament, to allow for new elections. But momentum now began to swing toward the regime. In response to de Gaulle’s address, 400,000 government supporters marched down the Champs-Elysées waving French flags and chanting right-wing slogans, including one that promised to send “Cohn-Bendit to Dachau.” This opening to the far right was no accident. To bolster the government’s standing on this front, the Interior Ministry soon announced that it would allow jailed members of the banned terrorist organization OAS to go free. With wind now in the sails of the government, workers began to slowly trickle back in during the first two weeks of June. The movement’s loss of momentum was compounded by the timing of a religious holiday, which meant there was a long weekend on June 2–4. The extra vacation day, following on the heels of de Gaulle’s speech, helped reverse the tide of the strike wave. In the public sector, the government made significant concessions on wages and other contentious issues and wrapped the strikes up over the next two weeks. With the Left divided and the tide now turning against the strikes, the administration felt emboldened to step up the campaign of repression against those who refused to give way. Pompidou now argued that “the motto ‘to work’ must be France’s slogan at this moment,” and the government showed it meant to enforce that slogan with force. To test this harder line, the state launched an assault on workers in the auto industry. On June 6, one thousand riot police from the CRS surrounded the occupied Renault plant at Flins after management accused union activists of sabotaging a vote on whether to end the strike. Police then occupied the factory. The government followed this up with a similar attack. In this case, the victims were striking workers at one of France’s largest factories, the giant Peugeot-Sochaux plant, home to over 25,000 employees. On June 10, after three weeks of work stoppages and following the failure of negotiations with workers occupying the factory, management, with government backing, decided to reopen the plant by force. That night, 6,000 officers from the CRS surrounded 1,000 workers and supporters, who erected barricades outside the factory and armed themselves with whatever makeshift weapons they could find. The fighting that followed saw police use guns, tear gas, and batons against the striking workers, two of whom were killed and 150 injured. In response, the student union, UNEF, called for a protest on June 12. It would prove to be the last public demonstration it organized as part of the May–June movement. The protest was broken up before it could begin, with police flooding the streets around the proposed meeting place to prevent attendees from participating. The next day, the government announced that it was prohibiting all public demonstrations for a period of several weeks and disbanding a number of organizations of the far left. It also decreed that foreigners caught participating in the protests would be deported. In the week that followed, the effectiveness of this more combative approach became clear. Broke and exhausted after almost a month of striking, and faced with the prospect of isolation, workers who had continued to resist now began to drift back to work. Meanwhile, the government had moved to vacate the most symbolically important occupations and expel protesters from their remaining strongholds: on June 14, the Odéon was retaken; two days later, the Sorbonne was cleared by police; and on the 27th, the occupation of the School of Fine Arts was brought to an end. The government’s ability to end the strike movement put it in an ideal position for the June 23 parliamentary elections. For the middle classes, the instability that the movement produced was indicative of the dangers of the totalitarian left. Despite the Communist Party’s denunciations of the excesses of “ultra-left adventurists,” and regardless of its efforts to bring the strikes to a rapid and successful close, in the minds of many French voters, the PCF was responsible for the disruption. By raising the specter of a Soviet dictatorship, the Gaullists were able to portray their opponents as Moscow-controlled totalitarians, while painting themselves as the defenders of order and liberty. The Left, meanwhile, entered the elections divided and rudderless. The Communist Party found itself increasingly at odds with the rest of the Left. As May turned to June, its relations with the student radicals, always tenuous at best, had become more and more contentious. As voters went to the polls, there was also considerable public sniping between the Communists and their socialist counterparts, including not just Mendès-France (whom the PCF had never much valued) but also Mitterrand, with whom it hoped to forge a governing coalition. By the evening of June 30, when the second round of voting had been completed, it was clear that the Left had been routed: while the PCF suffered a loss of nearly 40 seats (dropping from 73 to just 34), Mitterrand’s Federation of the Democratic and Socialist Left saw its representation fall from 118 to 57 deputies. Yet if the Gaullists emerged victorious from the election, for de Gaulle, the triumph was short-lived. The events of May had exposed the government’s fundamental weakness — it would never recover from this loss of prestige. De Gaulle himself now appeared increasingly as an anachronism whose outlook was no longer compatible with the demands of a modern society. Pompidou’s independence during the crisis led to his dismissal on July 10, 1968. Less than a year later, de Gaulle himself was forced from office after his defeat in an April 1969 referendum on two proposed amendments to the 1958 Constitution. His departure opened up space for Pompidou’s triumph in the presidential election that summer. The Left’s electoral defeats in 1968 and 1969 had important consequences for its future. Mendès-France, increasingly uncomfortable with the leftward turn of the PSU, quit the party and retired from politics soon afterwards. Others on the non-Communist left, however, became convinced that a new, more powerful vehicle was needed if it hoped to compete with the PCF for influence and challenge the Gaullists’ stranglehold on state power. Thus, Mitterrand decided in 1971 to join the newly formed Socialist Party, immediately becoming its standard bearer. Promising a “rupture” with capitalism, he entered negotiations with the PCF, which resulted in joint agreement on the “Common Program” in 1972. While Mitterrand’s relationship with the Communists would go through a series of ups and downs in the years that followed, these developments nonetheless set the stage for his 1981 election. For the far left, May ’68 marked the high point of a period of radical protest that would continue into the 1970s. While in France, mobilizations never again approached the peaks of that month, elsewhere in Europe there were movements that achieved a similar scale and breadth, such as the factory movement in Italy during the Hot Autumn of ’69. Nowhere else, however, was there such a concentrated explosion of student protests and workplace struggles. The interpretation offered by those, like Judt, who emphasize the lack of a shared political ideology or revolutionary agenda within the movement, overlaps with the assessments of a number of prominent ex-’68ers who have renounced the radical ambitions of their past. Now a Green parliamentarian, Daniel Cohn-Bendit has even written a book, appropriately titled, Forget 68 . Cohn-Bendit is hardly the only figure from the ’68 generation to trade in the radical politics of his student days for a more respectable brand of liberalism. Others who traveled down this road went even further in turning against the very radicalism that once drove their participation in the protests of ’68. Already by the mid-1970s, the collection of ex-leftists known as the “New Philosophers” were denouncing the movement for reviving Marxist ideologies, which they saw as containing the seeds of Soviet totalitarianism. May ’68 marked the high point of a period of radical protest that would continue into the 1970s. So what did May ’68 actually accomplish? In the short term, the movement secured a significant increase in pay for French workers — almost 11 percent in just one year. Public spending introduced by the government to appease the strikers also provided an additional 1.2 billion francs to households. After June, however, the collapse of the strike wave allowed French business to enjoy the fruits of a booming economy. 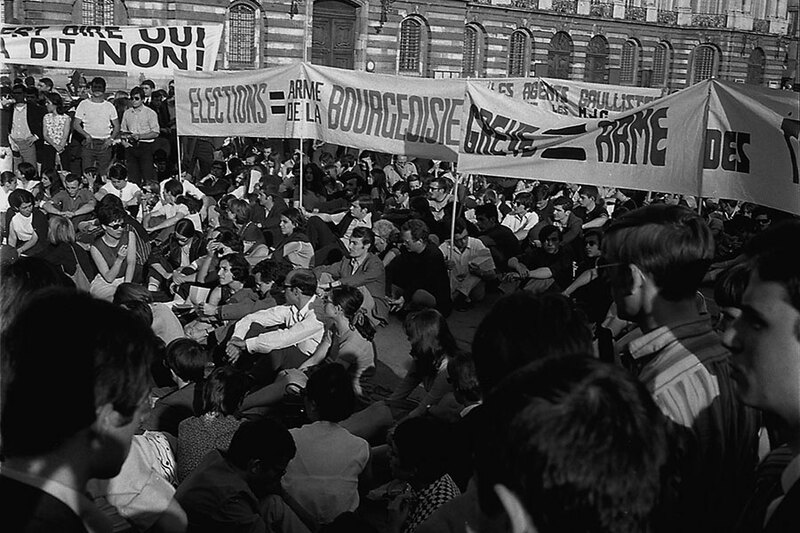 Overall, the French economy grew by more than 3 percent in 1968, despite the lost production due to the strikes. Industrial output increased by an impressive 7.4 percent. Afterwards, it became clear that, while the stinging defeat of the movement in June was a blow to the Left, it did not signal a rightward turn in French politics. In fact, the political climate of the early 1970s proved favorable to an enhanced reform agenda. During these years, feminists, gay-rights activists, and others began to mobilize, and a number of measures were adopted which would have been impossible a decade earlier: in 1974, for instance, legislation was introduced to allow women the right to abortion. Moreover, the fallout from May ’68 fed a general uptick in labor militancy which resulted in a 35 percent increase in real wages between 1969 and 1973. In fact, the years after 1968 saw considerable reforms to French capitalism. This period saw the introduction of a host of new or beefed up social-welfare benefits, a new statutory minimum wage, and rule changes to provide added protection for unions and workplace organizing, among other measures. Yet the gains of the movement clearly fell short of what most militants had hoped for during the heady days of May. For many on the Left, the primary culprit for this disappointing outcome was the PCF, whose sectarian conservatism and insistence on bringing the strikes to an early end was widely thought to have doomed the movement. It is true that the Communist Party was dismissive and hostile toward the student left — often in ways that were highly destructive — and exerted itself to reach a settlement with the government and employers to end the strike movement as soon as possible. In part, it was motivated by fears that the workers would be isolated, and by a desire to avoid giving the Gaullist regime an excuse to step up its repression or even launch a military coup. “If we are not under a dictatorship, it is because we did not let ourselves be swept away by our impatience,” one PCF leader argued. In part, however, its concern was to control an increasingly explosive situation for a labor movement it had long dominated. Above all, the Communists pinned their hopes on an electoral alliance with socialist leaders like Mitterrand, with the intention of forming a new coalition government along the lines of the 1930s Popular Front. That strategy proved a failure. However, that does not mean that revolution was on the agenda in 1968. As the veteran ’68ers Alain Krivine and Daniel Bensaïd note, “The strikers in their mass wanted to settle a social problem, shake the yoke of an authoritarian regime. From there to revolution there was still a long way to go.” But that does not mean a better outcome was impossible. What that might have looked like is up for debate: certainly, they might have secured more concessions than those offered in the Grenelle Accords; the socialist left could have come out of the movement stronger, with greater momentum and unity, than it did; and de Gaulle’s administration might not have held onto power. If nostalgia for the lost promise of a brief period of radical ascent half a century ago must be avoided, so too must the fatalism that says no other result was possible.